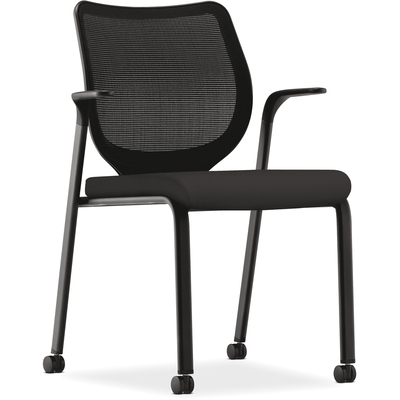 Multipurpose stacking chair delivers comfort from the inside out as a part of the HON Nucleus Series Seating. Inside the Nucleus seat, iliria-stretch NRAM material is pulled over a frame, and then over-molded with foam. This unique construction distributes weight evenly across the seat and eliminates pressure points for improved circulation and reduced muscle fatigue, delivering immediate, supportive comfort without the need for bulky padding. Once upholstered, this ultra-slim seat provides a soft initial cush and lasting, supportive comfort. Slender, contemporary look coordinates well with most open-plan systems. Four-leg base with casters provides sturdy support. Design also includes fixed arms and a breathable mesh back. Seat measures 19" wide x 19" deep while the back is 18" wide x 18-1/2" deep. Distance between the arms is 21-1/2". Usable seat depth is 18-1/2". Seat to floor height is 18-1/2". Chair holds up to 300 lb. and stacks up to four high.